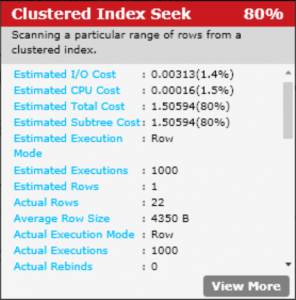 Another Execution Plan… In the Cloud! I didn’t go nuts in creating a crazy complex query. I just wanted to see a standard set of different operators to see how things changed. As before, I’m working off a controlled database that has identical structures and data in both the Azure database and my local copy of SQL Server. This way, the likelihood of identical plans is increased. Plus, if there are differences, it’s coming down to the differences in compilers between the two platforms, which makes things more interesting. If you click on it to blow it up, you’ll see a pretty standard plan. If we read it in logical fashion (left-to-right, making Rob proud) you’ll see that a nested loop joins data between the Agent table and another nested loop. That loop joins between yet another nested loop and the MovieStage table. That loop is between one more nested loop and the Movie table. The final loop is between the MovieStageResource table and the Resource table. Nothing shocking or weird. First thing that jumps out at you are the red operators. We’ll get to those in a minute. So the plan looks totally different, right? No, not really. It’s pretty much the same. The estimated operation costs are different, which is interesting, but the basic plan is the same. 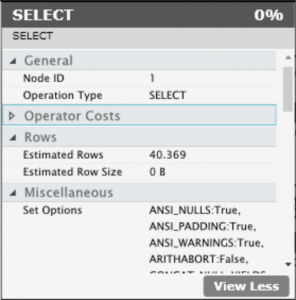 The first point to note is the Estimated Rows value. Here, in Azure, it is 40.369. 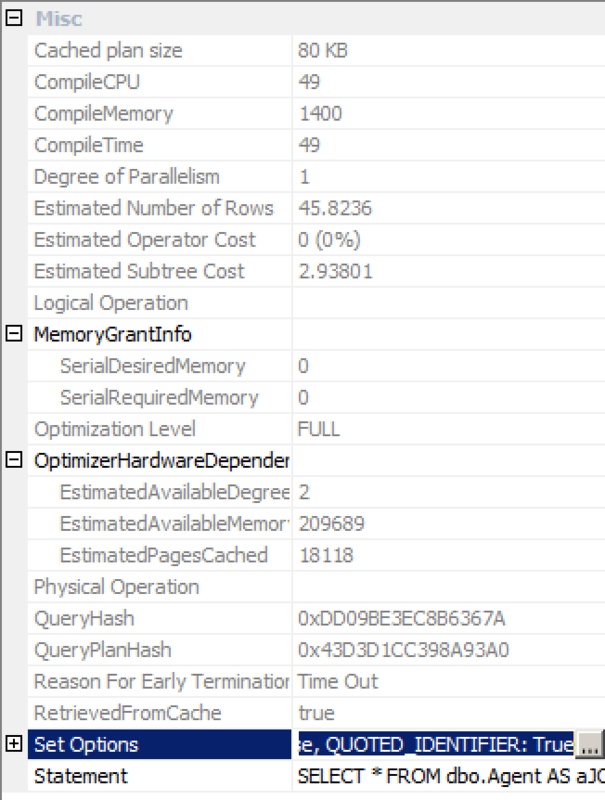 Meanwhile, back in SQL Server it is 40.8236. Now these differences are pretty subtle. I sure wouldn’t be sweating out of data statistics because of a .4546 discrepancy, but it gives us a clear indication why the estimated values for identical operations against identical data and structures are different. 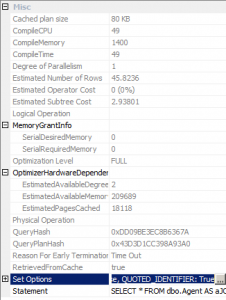 I’ll also note that the Optimization Level on the Azure query was also Full and the Reason for Early Termination was a timeout. These are fun and interesting results. 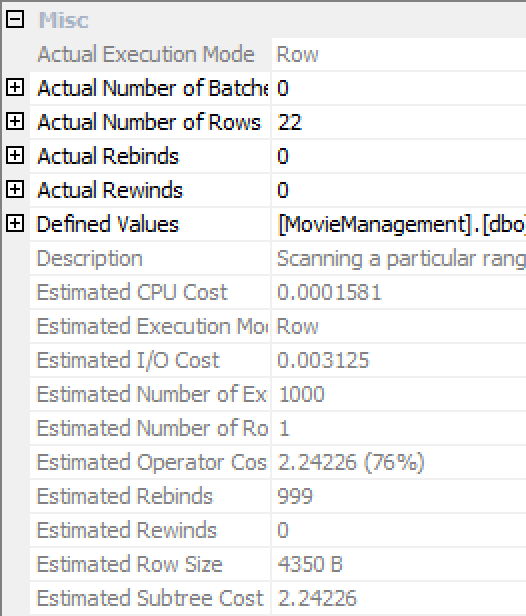 If you look at the Estimated Executions, Actual Rows, Average Row Size, Estimated I/O Cost and Estimated CPU Cost, they’re identical (with some rounding differences). 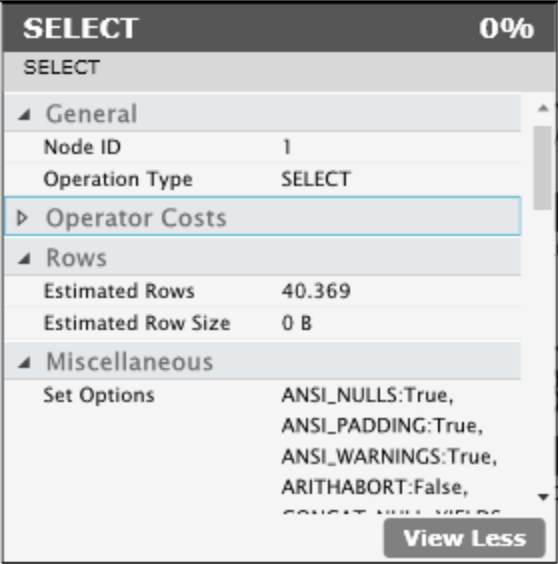 But… the estimated cost of the operation is different; 2.24226 in SQL Server and 1.50594 in Azure. How do I account for the difference? I don’t. 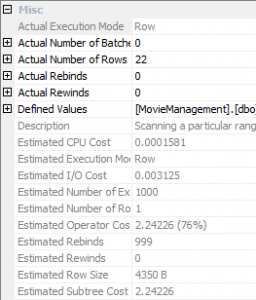 I think we’re looking at differences in how the optimizer establishes costs, because everything else looks the same. Clearly, while the optimizers behave in a very similar manner, after all, we got effectively identical execution plans, they are not the same. The small difference in the cost assigned by the optimizer informs us of this. I’ll have to play around some more with actually complex queries to see what else can be seen. If you enjoy this kind of drill down on queries, query tuning, execution plans and all that fun stuff, I’d like to suggest you sign up for my full-day pre-conference seminar at the PASS Summit 2012 this fall.